This tired old story? So some dude forfeited his chance to make a run at the High School State Championship in wrestling because he didn’t want to wrestle a girl. Full story here. Everybody has an opinion on this crap, and some folks are wondering why I haven’t offered mine. So, first off, been there, done that. Zack’s girlfriend crushed some dude in a Saved by The Bell episode after a pep talk by Slater. That guy didn’t back down… he stepped into the circle and took his chances. So, this kid Joel in Iowa said “As a matter of conscience and my faith I do not believe that it is appropriate for a boy to engage a girl in this manner.” Home schoolers… tough to understand sometimes. Ok, dude, I respect your decision… you stuck by your beliefs and that’s cool. However, I think you made the wrong decision…everybody’s got an opinion, right? One question, is there a religion out there that condones violence against women? It’s a friggin high school wrestling tournament. I’m guessing he was just scared of her moppin’ the floor with him. If he had a legitimate shot at the title, he’d have wrestled. I’m telling you… just like Zach’s girlfriend, he just needed a little pep talk. Who’s the right man for the job? John Winger. 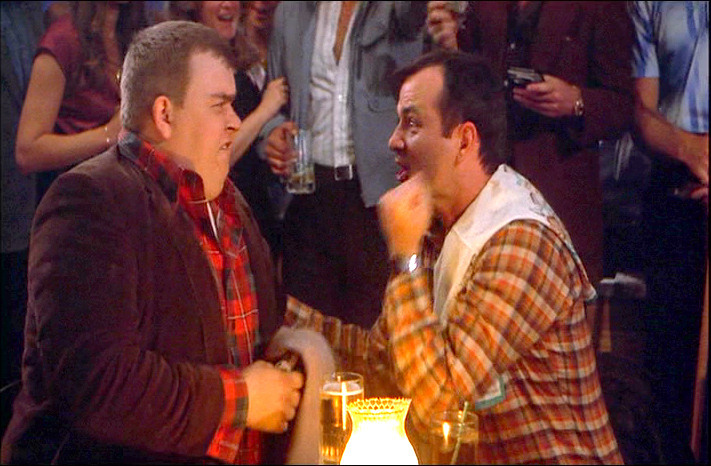 In Stripes, when John Candy’s character Ox was getting coaxed into mud wrestling with half a dozen chicks… he didn’t want to do it, either. Thankfully, Murray’s character John Winger was there to save the day. So, what happened next? Classic cinematic history is what. The girls started slapping him around and trying to trick him… started beating him bad. Did he give up?! NO! He ripped all their tops off and started dancing while the crowd cheered. This entry was posted in Movies, Sports, TV, Wrestling and tagged Bill Murray, Cassy Herkelman, Forfeited Wrestling match, High School Wrestling, Iowa, Joel Northrup, John Candy, Saved by the Bell, Stripes. Bookmark the permalink.